Beirut: Syrian regime aircraft Friday carried out at least 25 strikes on Daesh (the self-proclaimed Islamic State of Syria and the Levant)-controlled Palmyra, the country’s famed ancient city, with eight civilians among the dead, a monitoring group said. The Syrian Observatory for Human Rights said the raids killed “at least eight civilians and many members” of Daesh. The aerial barrage was “one of the strongest attacks by Syrian warplanes against positions in Palmyra since Daesh captured it” on May 21, according to Observatory head Rami Abdul Rahman. He said most residents had fled in the wake of the Daesh takeover, leaving only a few of the original inhabitants and the families of militants. 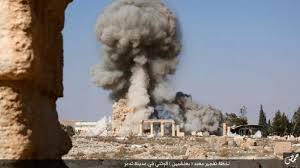 The terrorists have blown up the ancient Temple of Bel and several famed tower tombs in Palmyra, a UNESCO-listed world heritage site. Regime forces have fought hard to edge closer to the historic town. “In the past two days, the regime has intensified its air raids against areas controlled by [Daesh],” Abdel Rahman said. On Thursday, government air strikes on Raqqa city, Daesh’s de facto capital of a “caliphate” it has declared straddling Syria and Iraq, killed 18 people, including militants and civilians.